Padel is a form of racquet sport and is a close relative of tennis. Although not as popular as tennis across the world, it is particularly popular in Spanish speaking countries such as Mexico, Spain and Argentina. As a sport it is growing and the game is spreading into more and more countries across the globe year-on-year and its popularity in Spanish holiday resorts has exposed it to a lot of British visitors, making the UK one of the countries with the quickest uptake of the sport. Popular too in the USA, it is known there as Paddle and is often thought of as a game played in exclusive country clubs by the more affluent members of society. However, more and more schools are beginning to form Paddle clubs. As a game, it is very similar to tennis, however there are some slight differences. Played only in doubles, it is also played on an enclosed court that is significantly smaller than a tennis court and has walls that can be used during the game. However, the balls used are almost identical (although with slightly less pressure) and the scoring system is the same. 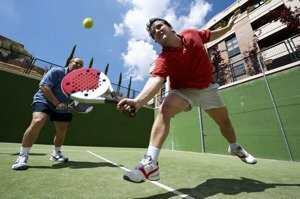 Padel is a relatively new sport invented in Mexico in 1969 by a gentleman known as Enrique Corcuera when he modified a plot of his land and paced walls all around it and began playing a form of tennis on it with a friend Mr Corcuera from Spain. The first official court was installed in an exclusive Marbella club and was popular with Argentinian Polo players who then took the game back to South America where its popularity spread even more. Padel is overseen by the International Padel Federation. The object of Padel is to win two out of the three sets that constitute a match. In doing so, each pairing must work as a team to outplay the opposition paring. Because the court is much smaller than in tennis and is enclosed, players are close together so need to develop a good understanding if they are to be successful and it is also important to be fit too. The pace of the game demands an awful lot from players which means that fitness should be at a premium to be a successful Padel pair. Padel is played on an enclosed court that is just over a third of the size of a tennis court and has a playing surface of 20m x 10m. Like a tennis court it is divided in the middle by a net but unlike tennis the court is surrounded by walls, which can be utilised by players during the game of Padel. The surface of the court can be made from a variety of materials, including cement, synthetic materials or artificial grass. The FIP also stipulates that the playing surface of a Padel court should be terracotta, blue or green. The racquets used in Padel differ substantially from tennis rackets. Padel racquets are made from composite materials with a perforated surface that is ergonomically designed to allow for airflow. The face measures 26cm x 29cm and the overall length of the racquet is 45cm. Because the racquet is much shorter than a tennis racquet, it is much easier to control. Scoring in Padel is exactly the same as in tennis. That means the points go up as follows: 15, 30, 40 and game. Should there be a tie on 40 - 40 then this is called deuce and the winner is the first player to lead by two clear points. Games of Padel are played as the best of three sets, each of which consist of six games. To win a set, a pairing should win six games with two clear games. If the score gets to 6-6, a tiebreak is played in which the winner is the first side to get to seven points with two clear points. If the game continues to be tied, then another tiebreak is played in which the first side to have a two game lead is declared the winner. The first pair to win two sets is declared the winner. Padel matches should be played on a regulation Padel court that is 20m x 10m and is blue, green or terracotta. Padel games shall be played between two pairs of players using regulation Padel racquets. Before a match, a coin is tossed. The winner gets to choose whether to serve first or which end of the court to start on. Each match begins with a serve, which must be done underarm but like tennis must go diagonally into the opponent's court. Both teams must attempt to score more points than their opponents. The ball hits the wire fencing or another fixture before going over the net or going into the opponent’s court (classed as out of bounds). Matches are made up of 3 sets, with each set made up of six games. The winners of two out of the three sets will be declared winners of the Padel match.